Too Many Users Left in Denial? OpenLM will help you maximize license usage. Report real-time denials and present actual need for licesnes. Send license availability notifications to end-users. End idle sessions and freeing licenses back into the system. Avoid unneeded acquisition of more licenses. 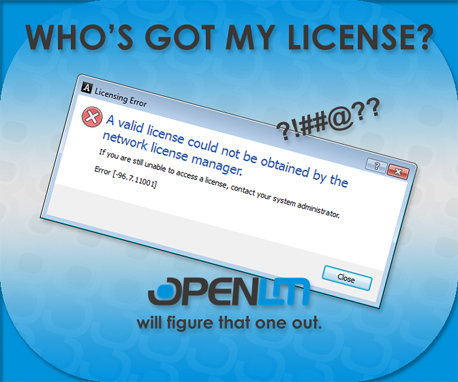 OpenLM - Stretching your licenses to their limits. Our firm has six offices across two states, so it’s easy to imagine that managing software licenses between all six locations proved time-consuming and inefficient. About two years ago, I purchased OpenLM to help get the most out of our license pool for ArcGIS and Civil 3D. With a limited number of licenses, we didn’t want to leave any unused. The software wasn’t difficult to set up, and, more importantly, it worked! We saw results immediately after implementing the program. We also found OpenLM’s reporting tool provides an unforeseen benefit by making it easy to see if or when we need to purchase additional licenses.